It’s not just tree lopping the North Brisbane Trees team do…check out this EXTREME PLANTING!! 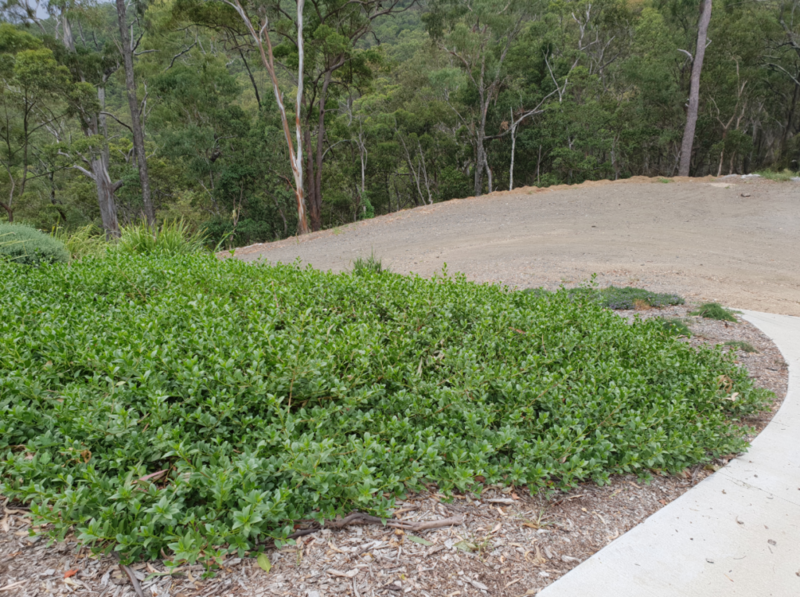 A regular customer of ours in Samford Valley had just had a dam constructed and had spoken with 3 other landscapers in Brisbane regarding the soil stabilisation of the 45 degree dam wall. 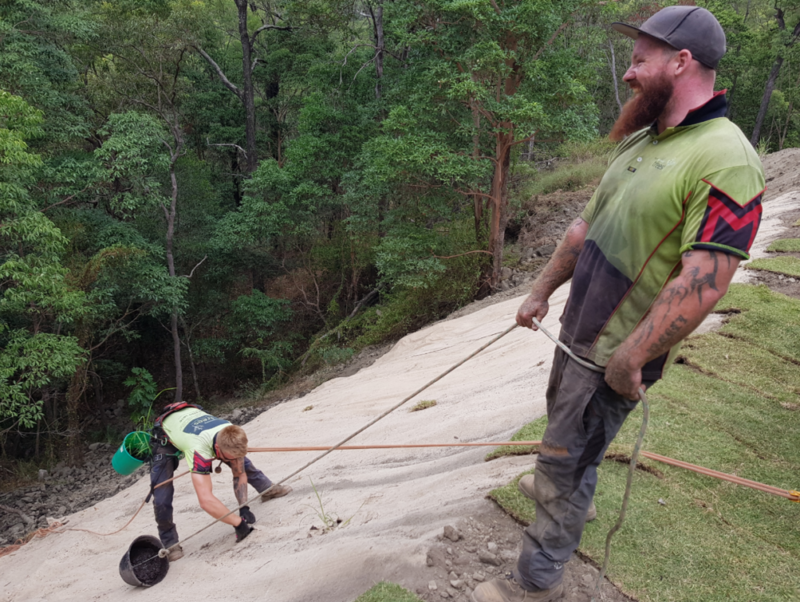 Unforunately, he couldn’t find a contractor willing to take on the job due to the steepness of the slope and the associated safety risks to staff. Cue, North Brisbane Trees. The stabilisation of both the top and the outer slope of dam walls is essential for maintaining a structurally sound wall. Without putting in place suitable measures, large ruts will form during heavy rain events and the dam wall will start to give way. The use of vegetation is generally the most economical and effective solution with turf grass being the ultimate in terms on soil stabilisation. 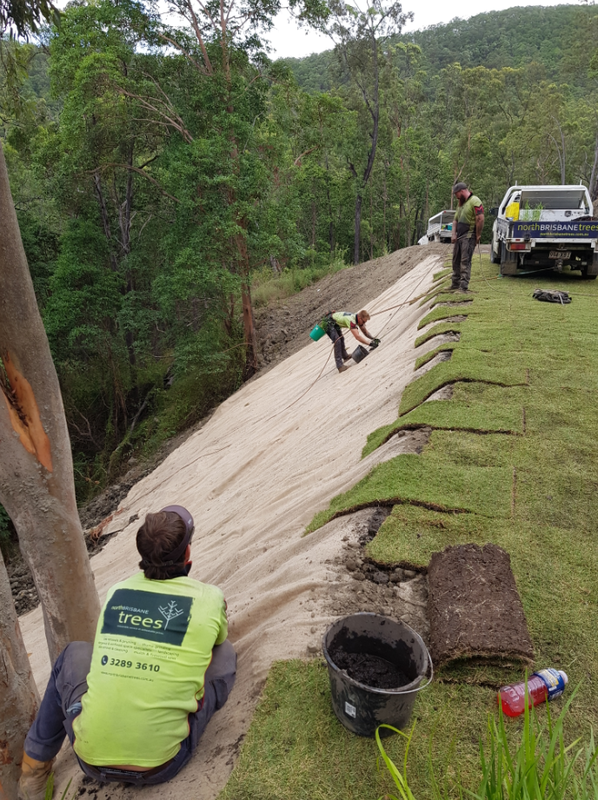 We chose a Wintergreen Couch grass for the top of the dam wall but due to the steepness of the side wall, this was not an option. Instead we recommended the installation of Jute matting in combination with the planting of 120 tubestock plants to stabilise this very steep wall. 1. Roll out and install 750gsm Jute Matting with a 100mm overlap. 2. Use a hammer or small mall to hammer in and secure the Jute Matting in place. On extreme slopes such as this we would recommend using 300mm long steel pins. 3. Cut 150mm x 1500mm crosses (+) into the jute matting at appropriate spacing for the chosen plant species, for ours we went with 2m’s spacing. 4. As effectively watering the plants on such a steep slope is extremely difficult, we recommend making up a slurry of saturated garden soil with fertilisers added to the mix. The consistency should be similar to wet concrete. 5. Use a small hand trowel to dig out approximately 1L of the existing soil (assuming it is of low quality) down the 100mm depth and replace with 1L of the soil mix as per instruction 4. A bucket tied to rope was used to bring the soil mix down to our Arborist. 6. Then it is just a matter of planting the tubestock plants into the mix soil mix and pressing down the jute matting around the plants. JOB DONE – WITH NO WATERING REQUIRED! 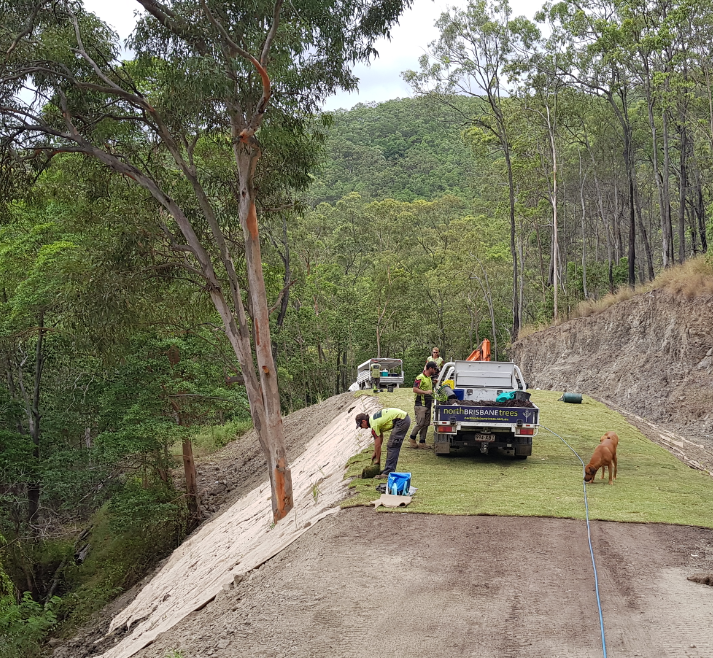 In the case of the Samford Valley dam wall job, all work on the embankment needed to be carried out by our qualified and experienced Arborists while safely harnessed in. Attempting to complete the above work on a slope such as this without proper safety equipment is not recommended! 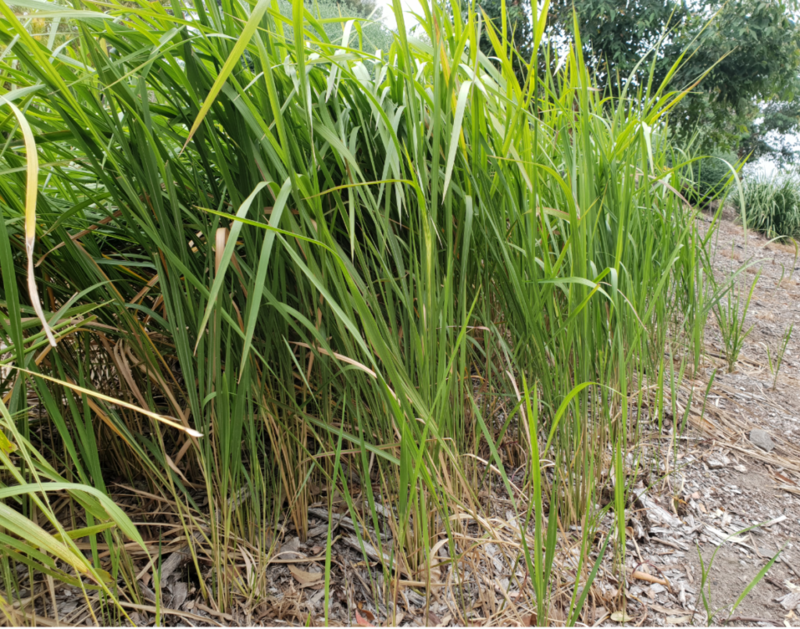 Lomandra longifolia was planted in a row at 1.5m spacings approx 500mm down from the turf. 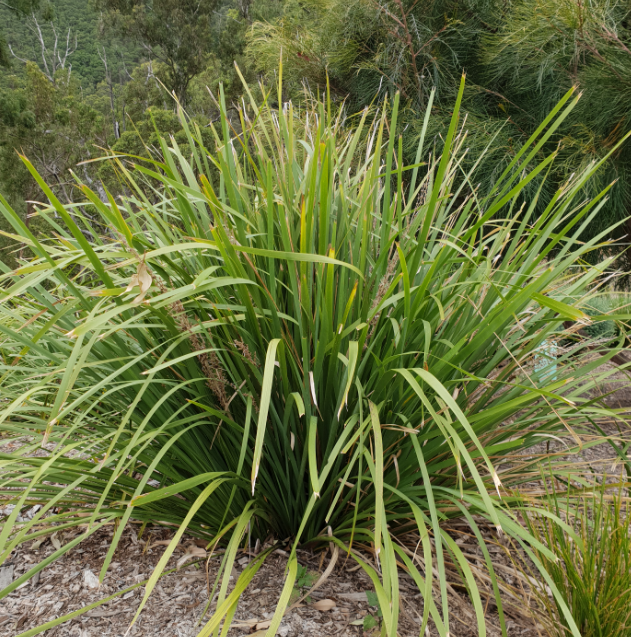 Lomandra longifolia is a tough as nails native grass which has very deeply rooted and almost impossible to remove by hand. This is a favourite for Councils in the Brisbane area for soil stabilisation, especially along water courses. Blady Grass or Imperata cylindrica is also a very tough grass which forms long creeping rhizomes. We planted a large grouping of about 50 blady grass which will in time form a dense thicket along the dam wall. Imperata cylindricata is commonly known as cogongrass, kunai grass, blady grass, alang-alang, lalang grass, coton wool grass and kura-kura. Mangrove Boobialla or Myoporum boninense subsp. australe is one of our favourite plants and is also commonly known as waterbush or pointed boobialla. Don’t be fooled by the name, this plant doesn’t need to be planted in or near water! In fact the opposite is true. When all your other plants are starting to wilt and are looking worse for wear after a long hot and dry Summer, the Mangrove Boobialla will be completely unaffected and looking amazing with it’s bright green foliage. We recommend hedging it at approx 400mm high a few times per year to keep it looking neat and tidy but this isn’t a requirement. In this particular project, the boobialla will form a dense cover and will protect the dam wall from erosion during heavy rain events. So while our qualified team of Arborists specialise in tree removal and tree pruning we’re also passionate about planting and landscaping so call the North Brisbane Trees team now as there’s yet to be a job that’s TOO EXTREME for us to tackle! Big congratulations to our Director Craig Bauer! The Queensland Arboricultural Association (QAA) has approved North Brisbane Trees as one of their Qualified Consultants! WATCH THIS: 5 arborists in action at the same time! A few months ago we experienced a new first for the North Brisbane Trees team. Check out this tree removal video of a gum tree that was damaged by a recent storm. Tree removals and tree lopping are best carried out by professionals with strong knowledge and public liability insurance. These trees hacked by Energex contractors in Brisbane deserve better! We recently read about Brisbane trees being ‘hacked’ by Energex contractors (by Ruth McCosker, Brisbane Times) and we felt as respectable tree professionals, we had to speak out. We share a grave concern for the welfare of the trees and the community that is impacted by this general lack of concern shown by Energex contractors when it comes to tree pruning and removals across Brisbane. What do you do when you need to have a massive 20 tonne Canary Island Date Palm tree removed from your backyard? Here are some before and after shots of one of our tree removal jobs. We removed 4 large Tallowwoods (Eucalyptus Microcorys) at Cedar Creek. Arborist or Tree Lopper – What’s the difference?